I went to Larry's shop to cut out some binding material (I don't have a table-saw – and you just can't get this type of thing done without one.) Binding is the wood that surrounds the outside edges of the guitar – protects the soundboard and the backboard. But the main reason I needed to do this right away was because I'm getting closer with the fretboard, and this will also have binding. You can purchase both binding and kerfing from catalogs, but I would rather make it from scratch. 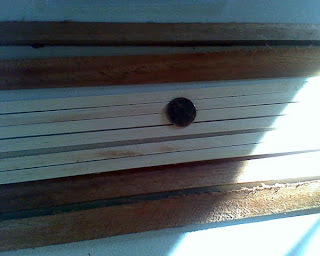 The completed binding strips. They are .25" x .080" x 36" The penny in the photo show how small these are. 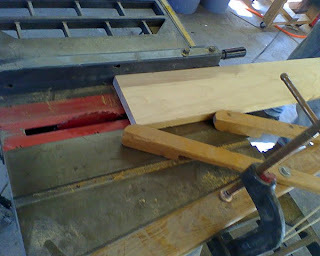 They are made from maple and the kerfing (above the binding) is made from mahogany. The kerfing is basically a triangle shaped piece .25" x .625" x 32". 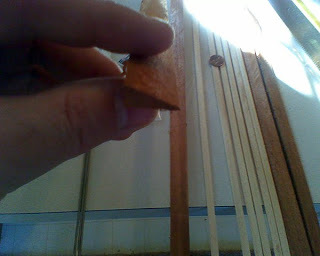 I will add cuts in the kerfing every quarter inch down the length so that it bends around the sides of the inside of the guitar to create a shelf for the soundboard and backboard. When I got home from Larry's shop on saturday. 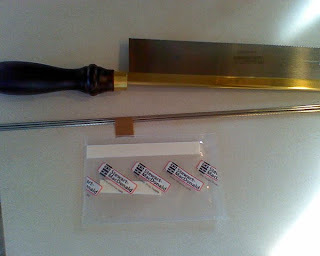 I was happy to find that stewart MacDonald delivered some tools and materials to my door! I got a fret saw (simple dove-tail type saw with a .023" kerf) Also some fret-wire and two pieces of bone (cow heel) for the nut and the saddle. These bones are actually just test runs as I'm making a new nut and saddle for my Charvel acoustic. This will give me some practice as I've always liked the sound from guitar's with bone better than plastic.